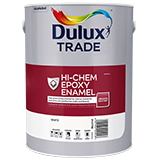 Dulux Trade Hichem Epoxy Enamel is a high gloss epoxy enamel for interior industrial and home use (e.g. garage floors, etc.) Can be applied on walls, floors and suitably primed metal surfaces. Cures to a hard film with good adhesion and abrasion resistance. Good resistance to a wide range of chemicals and most solvents. Suitable for surfaces that require frequent cleaning with solvents, detergents or alkaline cleaners. The cured film is non-toxic.